"What is going to happen to me, Father?" I ask before he gets away altogether. "Oh," he says absently, appearing to be thinking of something else, "you're going to end up killing Jews." "Okay," I say. Somehow 1 knew he was going to say this. Somehow also he knows that we've finished with each other. He reaches for the trapdoor, turns the rung. "Give my love to Ellen and the kids." At the very moment of his touching the rung, there is a tapping on the door from below. The door lifts against his hand. "That's Milton," says Father Smith in his workaday ham-operator voice and lifts the door. A head of close-cropped iron-gray hair pops up through the opening and a man springs into the room. To my astonishment the priest pays no attention to the new arrival, even though the three of us are now as close as three men in a small elevator. He takes my arm again. "Even if you were a combination of Edward R. Murrow, Walter Cronltite, and Charles Kuralt rolled into one—no, especially if you were those guys --"
"As a matter of fact, I happen to know Charlie Kuralt, and there is not a sweeter guy, a more tenderhearted person --"
"Right," says the priest ironically, still paying not the slightest attention to the stranger, and then, with his sly expression, asks, "Do you know where tenderness always leads?" "No, where?" I ask, watching the stranger with curiosity. "Tenderness is the first disguise of the murderer." 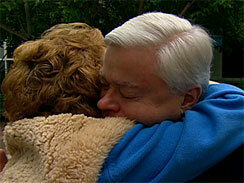 Did you watch the CBS Sunday Morning video from Barry Petersen? Good. At least we have a starting point -- a frame of reference. The ending point is that this story is as monstrous as it is tender. It is all the more monstrous because I can understand his anguish . . . the thinking . . . the rationalization . . . all wrapped in heartfelt tenderness. This tenderness leads -- if not, alas, to the gas chamber for poor Jan Chorlton -- at least to whitewashing her objectification. Her dehumanization. This is because -- you will note that she is referred to in the past tense -- everyone seems to see her humanity, all that makes her Jan, as being wrapped up in her mental function. 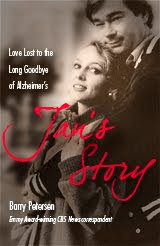 In her memory, which Alzheimer's has stolen from her. And it all makes sense, doesn't it? We observe that she is slipping away. We don't know her anymore, just as she doesn't know . . . anyone. Scientists can explain this. Scientists also can explain the angry outbursts Petersen described. There's a name for them -- Sundowners Syndrome, being that the episodes generally happen toward the end of the day. I KNOW a little about this. Alzheimer's killed my mother in law. We watched, my wife and I, as her mom began to act -- for lack of a better term than the indelicate -- stupidly. We watched as she tried to cover for her mental lapses and bizarre behavior. My wife struggled to make heads or tails of the retired bookkeeper's now-chaotic finances, as Mom fought her every step of the way. We did the whole take-away-the-car-keys thing. We watched as her personality changed, as she began to slip into a second adolescence, as she began to mindlessly shoplift from the corner convenience store. As her id began to overtake her superego. Then it was time for assisted living. It was time for spending down the last of her meager assets on her assisted-living bills. For my wife, her eldest surviving daughter -- the only child still in Omaha -- to get conservatorship, to deal with nursing-home and Medicaid caseworkers. For trying to find humor in the increasingly bizarre behavior, because if you didn't laugh, you wouldn't stop crying. For feeling guilty because you felt angry, because you didn't know who the hell this person in front of you was. She sure as hell wasn't Mom. AND FINALLY, it was time to be so overwhelmed as to feel nothing, because you were just another stranger Mom knew not. Another stranger she barely would acknowledge or look at with eyes that revealed. . . . Absolutely nothing. Nobody was home, and the lights were fading fast. It was an ongoing wake, only without the socializing in the funeral-home coffee shop. Her life ended in a darkened room in the locked "memory wing" of Douglas County Hospital -- the only option left when the assisted-living folks, unable to deal with Mom's increasing aggression, piled her into a taxicab on a snowy day and sent her there. Without that bit of heaven-sent socialism, God only knows what would have happened to her. The staffers at that charity hospital are saints. They do -- and do cheerfully -- what you and I can't . . . or won't. WE WATCHED Mom die -- my wife, my brother- and sister-in-law and me -- during the wee hours of a wintery mid-March morning in 2006. She turned gray, with her skin mottled, from the feet up. Her breaths grew shallower and farther between. And then they stopped. Mom didn't have Alzheimer's anymore. And we could start to remember what she was like . . . before. And we also could begin to be gripped with fear every time we have a "senior moment." Is this it? Am I next? Is my wife -- Mom's daughter? Oh dear God, how could I bear it? One way or another, Jan Chorlton and Barry Petersen are living our worst nightmare. No, my worst nightmare is that I would succumb to what tormented Petersen, then put what I longed for before what my dear wife deserved. What she deserves is for me to fulfill the vows I made to her and to God almost 27 years ago. What she deserves is for me never to abandon her -- nor for me to offend her dignity by screwing another woman with impunity, with her powerless to object, then making like we're some sort of bittersweet, loving ménage à trois (albeit one where only two of us would be having any fun). Damn it, love is not just an emotion -- it is an occasion of grace and (sometimes) an agonizing, brute act of one's fallen will. But this story . . . it's all so tender, no? No doubt. Tenderness that justifies betrayal. Tenderness that makes adultery seem so . . . reasonable . . . civilized . . . compassionate . . . open-minded. Petersen's is a tenderness that I can get my head -- and my heart -- around. You want to cut the lonely, hurting guy a break. And that scares the hell out of me. Because it all offends the human dignity of the helpless person we've all just dehumanized here -- Jan Chorlton . . . Petersen. Who is still Barry Petersen's wife. And who we -- tenderly, of course -- regard as figuratively dead, if not technically so. I mean, it's obvious, isn't it? AND THAT right there is the g*ddamned lie. And the God-damned one, too. Because if you can buy that bit of utter dehumanization and objectification in the name of compassion and tenderness, it ain't that far a trip to the gas chamber.